Ο Οδυσσέας never returned. We will always remember him as the Greek who lost his path. Since our young days old men have sat around the fire getting drunk and praying for Οδυσσέας. They named all the streets of their modern capital with his mysterious name. This was his fate. To follow the sun, to surrender among all of these ancient mirrors. Even their children have his name. His loss became a curse. They say that the blind poet imagined the terror but never revealed anything to us. Even a well known Italian writer mentioned his absence. Difficult years came, ο Οδυσσέας got old. He lives now in Rotterdam, Berlin, Melbourne, America, Asia, at the edge of the city borders, among the lights who lose their faith every night and get weaker and weaker in front of the coming daybreak. He spends his life at the harbour, reviving his voyage. Nafsika, Kirki, the terrible death of so many companions; the blind giant who still seeks him out to exact his revenge. Every single thing comes to his mind. That' s why behind his eyes a fire struggles, burning within him. He works as a porter downtown, serving all of his life and his dignity. His soul cost nothing. His room has a single window. The moon is nailed on to the shutters, the load of history is nailed on to his shoulders. He will never find Ithaca. The Gods have died. Those who are still alive live among us, following every day the stable orbit of our mass transportation, talk hastily and travel on their illuminated rafts. Ο Οδυσσέας is the greatest loneliness of all time. Someone says that he is "dancing on the shark' s fin" and there is no other way, no other paintιngs, no other colours to re-enact his pain. That' s his life in Rotterdam, at the old house, among the ruins of an ideal love, such as the one of Zeus and Europe. Only throughout the summer he lives again in the purity of the sea, while he abandons his soul, offering his body to his archaic ancestry. His dray left at the seaside like the carriages of an Achilles painted during his anger by Giannis Moralis. There is nothing left to remind us of him. Ο Οδυσσέας is beyond anything, an idea. His return was never the point. The crowd travel beside him, carrying the decades, the flags of a past glory, overwhelming the avenues of the world. If you see him, if you stand in front of him, deep inside the fog of the morning humility tells him that we are still waiting for him to adduce with our cutting breath. We cry alone at night, praying for this hopeful moment, when he seems behind the curtains of the world theatre, among the lines and the curves and the pelagic statues of a lost beauty. The return of Οδυσσέας is the poem which can become the preamble and the beginning of a new, Greek era. Imagine. Look at Οδυσσέας on his little boat, rushing into the sea while the old men of our beginning clench their knives while the young girls are struggling not to cry. They compose the portrait of our time behind the windows, like the ancients, respectful daughters. Οδυσσέας prepares to narrate the achievements of a new born life. Ο Οδυσσέας doesn't have a biography. His journey is his life, his signal, his print. He must return. 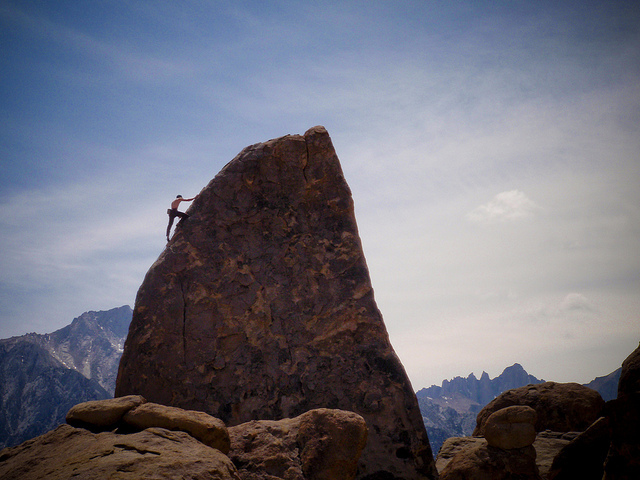 Image: "Climbing Sharks Fin in California" by Lena Chang.